Install Greasemonkey in your Firefox. Note: If you're on a low bandwidth internet, you must wait for few seconds so all emoticons loaded, and then toolbar will be inserted into edit section. Original script is written by Sharath(http://userscripts.org/scripts/show/12946), I just added a new option which has list of deviantART emoticons. If you find problem installing, feel free to ask me anything. Will be waiting for your reviews and comments on it. Update: Updated with a "Promote This" Button and new links. You can use it to promote this script. :) Take the cursor at the end and click it!. fantastic way ...! its pretty cool ! you are genius buddy! you are reducing the troubles of thousands of computer users! Cheers! Keep It Up! 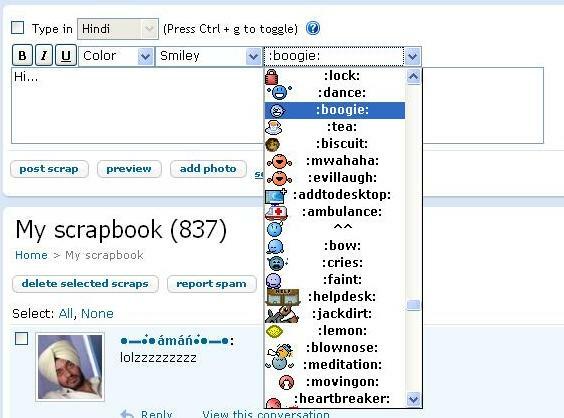 heYyy daMn Dis Is nT wRoKin iN oRkut.. I m usIn gmOzIlla wiD greasemonkey bT itz nT workIN.. 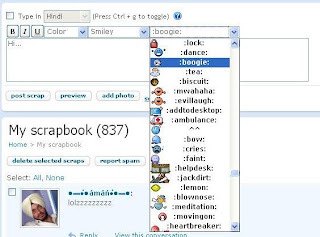 It is still working in the Old Version of Orkut. Try to reinstall everything again.